The latest Web Analytics Wednesday presentation was given by Matt Lovell from fashion retailer Jack Wills on the topic of personalisation. Prior to this role, Matt was at Thomas Cook for three years as Head of Digital analytics. Matt’s presentation was entitled ‘Practical personalisation’ and contained (as the title suggests) lots of common sense tips and techniques. There are some well-known barriers to personalisation, Matt explained Perhaps the biggest one is the inability to connect data. Organisations will often find that they have the data but are unable to implement key technology to manage this data, capture it correctly or push it into the right systems to get a joined up view of the customer. Related to this is the familiar reality of business silos. Data generally resides in lots of different departments and it becomes hard to centralise it or make it accessible to connect it. The third barrier (and probably the least spoken one) is inertia. And of course there is just the human fear of getting it wrong. Matt told us how he likes his music band he is subscribed to emails from a record label. He likes five different bands. He received an email from each on his birthday, all identical bar the name of the band and a picture. The impact was weakened as they arrived in a stack into his inbox. There was no incentive or information. No concert dates or album releases or a discount code to the band’s merchandise store. These emails served no purpose. If you are going to capture information about the customer have a good reason. How does it benefit the customer? Matt discussed the role of premium tools in the personalisation space. Although before you can convince the board that you need budget for these, his plan is to prove that personalisation works. In terms of personalisation Matt has put three things in place. Firstly a triggered welcome email, secondly a split in emails just by gender, including gender split in landing page and finally a next buy option of other items that match the clothing item the customer is interested in. All of these have shown a significant increase in sales. 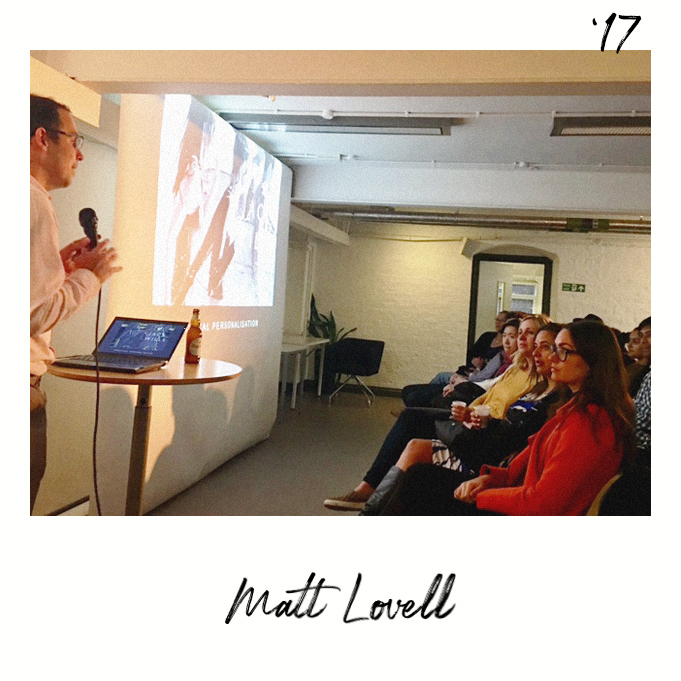 Matt gave two pieces of advice, some basic common sense personalisation is possible even if all you have is a ‘free’ toolset (excel and GA). Secondly, it’s great to start off small with a proof of concept and that is the useful way to get buy in. GDPR is a hot topic and at the last couple of events there have been questions focussed on this. Matt discussed how GDPR compliance is all about being explicit and being clear about why customers should sign up and how you wish to use their data. Matt discussed matching online data and store data and tracking across devices. He wants to look at dynamic content and above all, his mantra is test test test. Obviously any customer Insight person worth their salt wants to find out more about the customer and Matt understands that this is about consistently improving the experience and tweaking the personalised experience over time. This includes working with the content team on user generated content. Matt has learned that if you want analytics to work it’s great to get all the departments on board early. To take part in this year’s survey and receive a free copy of the report click here.